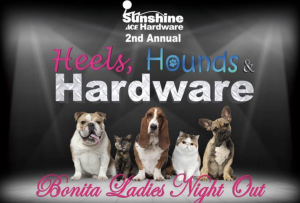 Sunshine Ace Hardware is calling all ladies in Southwest Florida to enjoy a night of fun during its second annual Bonita Ladies Night Out, “Heels, Hounds and Hardware” on Thursday, Nov. 16 from 6 to 9 p.m. at the Sunshine Ace Hardware store in Bonita Springs, located at 9100 Bonita Beach Rd. Ladies will enjoy a night filled with entertainment, activities and special offers, and the first 100 ladies will receive a gift bag with contents valued over $50. This free event features DIY demonstrations, a fashion show featuring ensembles from the women’s and men’s sporting goods sections, wine tasting, food samples, and a raffle, as well as an exclusive discount of 20 percent off their entire purchase. Attendees will have the opportunity to participate in a raffle for the chance to win an assortment of leading products including a Weber Grill, Valspar paint, Tervis wine glass sets, assorted 3M products and more. Proceeds from the raffle will benefit Brooke’s Legacy Animal Rescue, a local animal adoption agency that offers second chances to an array of animals throughout Southwest Florida. For more information about the annual Bonita Ladies Night Out, visit the event page on Sunshine Ace Hardware’s Facebook at https://www.facebook.com/SunshineAce/. Brooke’s Legacy Animal Rescue, a local non-profit animal adoption agency, specializes in giving animals another chance in life and offering opportunities for animals to find new homes with committed families. The adoption agency, established in memory of Brooke Ashley Miller, a local teenager who tragically lost her life in a car accident, is an organization operated by volunteers who foster the animals until they are adopted. The adoption agency hosts consistent adoption events throughout Southwest Florida. For more information or to adopt an animal from Brooke’s Legacy Animal Rescue, visit www.brookeslegacyanimalrescue.org.